The POE-161 is a Single-Port, Mid-Span IEEE 802.3at High Power over Ethernet Injector with maximum up to 30 watts of power output over Ethernet cables. It is designed specifically to fill the demand of the growing higher power required network equipment such as PTZ (Pan, Tilt & Zoom) network cameras, PTZ Speed Dome, color touch-screen / video and voice over IP (VoIP) telephones, multi-channel (11a / b / g / n) wireless LAN access points and other network devices that need higher power to function normally. The POE-161 High Power Injector is an ideal solution to delivering data and power to network devices directly via the RJ-45 Port interface without the need of installing extra power outlets and electrical cabling. The POE-161 is a Mid-Span IEEE 802.3at Gigabit High Power over Ethernet Injector which provides DC 56V over Ethernet cables. The POE-161 inserts DC voltage into Cat.5/5e/6 cable, allowing the cable between the Injector (POE-161) and Splitter (POE-162S) to transfer data and power simultaneously for up to 100 meters. 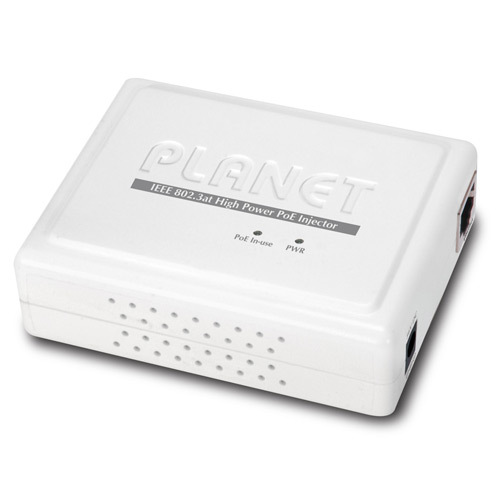 The POE-161 delivers the Ethernet digital data with power over the twisted pair cables as an IEEE 802.3at Gigabit High Power over Ethernet Injector, and the connected IEEE 802.3at Gigabit High Power over Ethernet splitter will spilt the digital data and the power into two selectable DC outputs (12VDC / 24VDC). With IEEE 802.3at Gigabit High Power over Ethernet devices installed, the system administrator can use only one single RJ-45 Ethernet cable to carry both power and data to each device. Besides, by connecting to the high power PoE splitter POE-162S, the POE-161 can offer benefits of cost saving, easy networking planning and high reliability. Upon the installation of IEEE 802.3at compliant devices, the POE-161, when functioning with the POE-162S, can keep the connection while migrating or splitting the power and the Ethernet digital packets. It thus reduces cables, eliminates the need for dedicated electrical outlets on the wall, ceiling or any unreachable place, and most of all, reduces installation time. The high Power over Ethernet solution frees the Security IP Camera and wireless AP deployment from restrictions of power outlet locations. With its capability of IEEE 802.3at Power over Ethernet, the POE-161 can directly connect with any IEEE 802.3at end-nodes like PTZ (Pan, Tilt & Zoom) network cameras, PTZ Speed Dome, color touch-screen Voice over IP (VoIP) telephones, multi-channel wireless LAN access points and other network devices which support IEEE 802.3at Power over Ethernet . For a place which is hard to find the power inlet, the POE-161 and POE-162S operate as a pair to provide the easiest way to power your Ethernet devices which need high power input, such as PTZ (Pan, Tilt & Zoom) network cameras, PTZ Speed Dome, color touch-screen Voice over IP (VoIP) telephones, and multi-channel wireless LAN access points installed on the top of the building or used in enterprise office or home. Power Consumption	 30 watts (max). 2011-10-05 1.1 IEEE 802.3at redefine.